Last month we reviewed My Farm and had mixed feelings about the game, but ultimately it was deemed a decent game for the young audience the game was targeting, but how does My Exotic Farm stack up against its predecessor? Keep reading to find out! The gameplay in My Exotic Farm is the same as it was in my farm which isn't bad if you are under the age of 10, but teenagers and adults will struggle to enjoy this title. The game isn't bad by any means, however it's overly simplistic for older audiences. 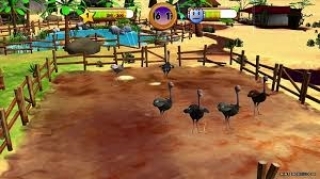 You basically start off with just one Ostrich and must grow your farm into the ultimate exotic farm! You need to keep the animals and farm clean, feed the animals and give them medicine when they are sick, etc. The addition of exotic animals is a nice touch, but doesn't add much to the game. The controls are just as easy to use as they were in My Farm which is a very good thing. The only downside is that there doesn't appear to be Off-TV play, but otherwise the Gamepad is utilized nicely in this game! The graphics in My Farm were atrocious, but thankfully that isn't the case in My Exotic Farm, sure the graphics aren't as good as they could be, but at least the animals are recognizable now and the graphics are much more crisp as well. The music and sound effects are simple, but work nicely with the game. Overall the game deserves praise for improving upon it's predecessor's greatest downfall! 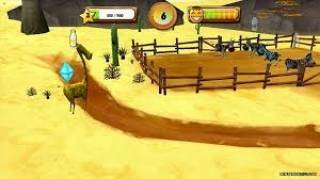 With decent gameplay that young kids will undoubtedly enjoy and easy to learn controls My Exotic farm certainly isn't shovelware, the use of the Gamepad in the game is fairly satisfying as well! My Exotic Farm has been vastly improved from My Farm at least visually which is why this game is receiving a better score! 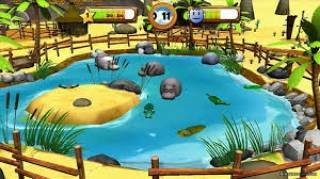 All-in-all My Exotic Farm is good at what it attempts to be which is a simple farm simulation targeting young kids. How do you guys like the new scoring format? Please let me know here in the comments. This new format is in preparation of a much bigger change in the design of our review pages that we are working on right now! Hopefully we'll be able to implement these changes within the next couple of months.